1. The best is strangely No Rewards. Just an upfront discount. This way you spend less for getting the same. 2. The next is a straight % rebate. The best best case is you get a combination of 1 and 4, but I havent seen it offered. The best available is 2+4. Though the most widely available is 3+4, and the worst is just 4. argh. 2. Buy $108 worth of Goods. 5% rebate. You spend $108, get $108's worth, and $5.40 discount on your next purchase. 4. Buy $108 worth of Goods. $5 spent = 1 point. You spend $108, get $108's worth, and 21 points, and you need 200 points to get $10 worth in voucher. And you most likely forfeit the excess points which do not add you to the lowest/ next tier for exchange. You feel that you are getting a discount on your current purchase since you get rebates credited to you, AND when using your rebate points in your next purchase, you feel that you are getting a discount or even FREE (if fully credited against rebate points). NOT TRUE. You are effectively paying FULL PRICE NOW, for a discount on the next purchase. It is only an illusion, you only FEEL that you are getting 2 bites of the cherry, which is too good to be true. No wonder more shops and credit cards are offering rebates. We've met less people this year compared to the last, partly because of timing issues, poeple taking the chance to take a family holiday, and other unhappy family circumstances such as divorce/ death, especially of the elderly matriachs of the families. I lost a god-granny on my Dad's side last year and E lost his maternal granny the previous year. Thus losing the glue that held many generations of families together. Where do you go now for the huge gatherings where everybody congregated, when Granny is no longer around? Do you still have that huge gathering? At the eldest son/ daughter of the martriach who doesnt remember your name? Neither does the granny, but that's a totally different matter. In the era where fast food is available on the 1st Day of CNY, scheduling to eat at a relative's open house complete with food is no longer a necessity, but it is still nice to be able to eat some hot home cooked food when ever. It just spells family warmth and friendship. Is Chinese New Year about money? That's how I came away feeling after visiting my nanny. I usually meet her on the 2nd day, too late to have met her grandchildren who visits her on the 1st day. So I've taken to leaving my ang pows for them with her to pass to them when she sees them next (goodness knows when tho), and their parents leave their angpow for my kids with her too. But but but I thought i was wishing the children 身材健康, 快高长大, 学业进步? Just transfer the angpow to my kids? Do the wishes still go through or are they transferred as well? I bought much less gifts (the bak kwa, biscuit goodies, limpets, etc) this year compared to previous years. So why bother? Lets not do for the sake of good will, good wishes or face. Ah, but the abalone, orange and the angpow cannot be leat out lah. I donated $100 to World Vision's Share a Bowl of Rice with Needy Childre in Laos. One of the best gifts I've given this CNY. Just rice, not abalone, not new clothes or shoes, not money in a red packet to be fritted away at a kiddy gambling table. But i know it is well needed and well appreciated. And it gives me a warm fuzzy feeling inside. Just like the Goat and School Bags with supplies that I bought last Christmas from World Vision's Life-Changing Gift Catalogue 2006, and the winter clothings the previous Christimas. Last year's Christmas gift via World Vision was $140, just about the amount i spent on gifts for my family too. But the difference between the 2 was giving a lifeline to people who needed them, and (more likely than not) adding to the pile of toys soon to be used, spoilt and discarded. I just might start spending more on the World Vision gifts from now on, afterall, we are already blessed with roof over our head, abundent food and clothing and toys (or whatever you call your latest geek stuff), work opportunities, creature comforts and lots more. My kids will understand. They have to. After 2 consequtive disastrous meals in Cafe Cartel for the food and Pine Court for the service, I felt that I deserved a good meal at a good restuarant. 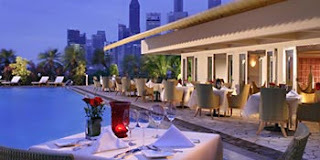 The Mediterranean restuarant was located pool side on Level 5 of Oriental Hotel, and has bay window/ doors on 2 sides, with tables both indoors and outdoors. We chose indoors for it was a quiet night in the restuarant, and the wind was simply too stong outdoors for comfortable dining. They showed us to a table in corner next to the pool and in view of the glass-enclosed open window. Nice! I started with a Riesling and E a Tiger while we studied the menu. Everything looked good, in the end we went for the 6-course sets. The loving couple that we are, we shared EVERYTHING, so that we can taste all the different food lah. As each beautifully presented dish was served, the server gave us the name of the dish, the ingredients and even the type of sauce (drizzled artisically around the plate) and bade us a good dinner every time. And when each dish was done, the server asked for our permission to clear away the dishes and utensils, and noiselessly took them away. Serious, not a sound of fork/ knife clanging against the porcelain plates. E finished his beer and wanted a red wine. I told him Pinot Noir is very in nowadays. He ordered "A red glass of Pinot Noir"
I laughed and asked him why did he order like that? He sheepishly said he actually wanted "A glass of red Pinot Noir", not a red glass. I told him Pinot Noir (a type Black Skin Grape) is always red. He insisted that he saw from the wine list that there was indeed a Pinot Noir under White. I suspected it was Pinot Gris (the white variety of Pinot Nori) and true enough, he found that term in the wine list. It was a relaxing and blissful meal lasting almost 2 hours. After that, we loitered outside the restuarant to take in the Singapore skyline in the night sky... bliss. Was at Pine Court @ Mandarin Hotel over the weekend for a triple celebration. E's birthday + Nephew C's birthday + reunion dinner with extended family. The first thing that went wrong when we sat down was there weren't enough chairs. They had given us seating for 10 adult + 2 baby chairs instead of 12 adult + 2 baby chairs. Thankfully we had 1 less adult in attendance but then there was no way to squeeze in that 1 chair in the table originally meant for 10. Perhaps, just to give them the benefit of doubt, there was really communication mix-up from us or between us and the restuarant, but the ONLY solution that they could come up with was to move the baby chairs further back so that they will free up space for the adult chairs. They also didnt have enough baby chairs with the serving table, so what gives? The tots don't have to eat? We were flustered becos we had old people with us and didnt want to create a scene, but that ONLY "solution" was not acceptable. In the end, WE gave them the solution to change 1 adult chair to squeeze a child in, and some adults sitting precariously at the edge of their chairs to make room for 1 more. The restuarant was 70% full. There was a family of 4-5 tables celebrating a birthday, and a 5 tables of Japs (tour?) and scattered guests. I have a lowly expectation for service, even from a used-to-be-fine-dining restuarant like Pine Court, but they went below my lowly expectations. The food came at uneven pace, and the waiter and waitresses decided to push our individual plates aside to make room for new dishes, without so much as an "excuse me". Sometimes even leaning across us while we were eating to leave the dishes hurriedly. They even did that to my Grandma, and I was so angry that I almost bang the table and shouted at them. In the end, I threw down the chop sticks in disgust and held on to Baby J's shoulder to pretend that I didnt want her to be scalded by the hot dishes being served. I think Dad and Sis could see my displeasure but we were all trying to control our temper to not mar the triple celebrations and frighten Grandma. For once, they did away with those ridiculour individual pots of tea with a burning tea light each (@ S$5+++), and served tea in regular tea pot for each table. Unfortunately, even this managed a screw up. We were a table of total 13 people, how many cups of tea can a regular tea pot serve? Rather than sitting blissfully for tea to be served to us, we served ourselves. Rather than them noticing that the tea pot is empty (with the lid up) we had to ask them to refill. After a while, the tea pot didnt come back. We asked, they looked blankly and told us that it was being refilled. We waited still no tea and asked again, then a waitress came back with a pot in hand. We expected tea to be served but NOOOO.... we asked again. The same waitress replied with a finger pointing to the empty table NEXT to us "Your table too full, so I left the tea pot on THAT table". This was so ludicious that I had to give her a round of applause, AND.... wait for it.... still no serving of tea. In the end, I had to extricate myself from our tight seating to bring the tea pot over and poured myself tea. ONLY THEN did another waitress deigned to come over to take over the tea pot to serve the rest of us. Now, we go to Pine Court often, at least once a month, more likely twice to 3 times, just because mom has some kind of gourment membership, and knows the waitresses. So much so that it was almost de rigour for us to get free deserts after our meals. Unfortunately, familiarity breeds contempt. Instead of treating their very regular customer with respect and efficient service, they chose to serve those other tables first. What? Regular customers are supposed to be more understanding and forgiving? Noooo... they become no-longer-regular customers. The food was good as usual, but i left with a bad taste in my mouth. Met up with a few forumers, okay, the owners and moderators wor... and a couple of forumers from www.WantToTrade.sg for dinner and TCSS at The Cafe Cartel-Marina Square last Friday. Was horrible driving AYE-ECP to Marina area, so many cars in bumper to bumper traffic on Friday evening jam and so many motorbikes zipping in between lanes, that filering took triple-checks on blindspots and rear-mirror. AND it took me 1:15hr to get from office to Marina Square. Heng* heng* parking was all right. Once there, Paddy and Izel, ChoonLye, Mach5, Philipchai, were already having a drink and chatting away. I was super hungry by then and we ordered some snacks. Garlic Bread, Platter with Calamari and stuff, Potato Wedges, and Nachos with cheese. The were alright, and we soon polished all of them off. The service was perfunctionary, efficient with no smile from the harried staff. I suppose partly from the time-and-energy-wasting practice of having to reprint and reconfirm every additional order as they are ordered and served. Did they have too many moochers that disputed bills? Or staff simply forgetting too many orders? The water jug, water glass, chilli and tomato sauce, side plates were stacked in a central island for self service. We didnt know and had asked the staff to serve us those, which to their credit, were given to us quickly without complaining (or the smile). Then Iris and ShuffleArt came and we started ordering main courses. I couldnt decide at first but chose a sirloin steak. To my surprise, the dish was served with pasta and some sorry looking veg and baby carrots. And the steak was the size of 2 hot dogs, half of it being the fat from a sirloin steak. It did come medium rare as ordered, but the meat was so stringy that i had to chew it to death before being able to swallow anything. The pasta was drowning in some suspicious sweet brown sauce, and the baby carrots were cooked in sugar syrup. Ew. Bleah. Argh. Worst dish i've had the misfortune of having in a very very long time. Izel's fish and chip (i asked for a sample) didnt come any better and tasted exactly like very peppery card board. Fish's fish and chip looked better. ShufferArt's grilled chicken look all right, as did Philip's pork ribs. ChoonLye didnt like his meat platter. No more gatherings at Cafe Cartel ok? or i'll stick with the side-dishes. After the MOD, we were tired and hungry and needed lunch. Checked the road directory that the nearest non-Mac was Railway Mall which sounded interesting. After parking at the previously-private-carpark, we decided to go for Raman, but walking there, we were drawn to a place called HOOKED! which sold mostly fish, with cute colorful childlike murals of undersea world on the wall, a mermaid, prawns, shells, octopus, fish, weeds etc, and TVs showing sports channel. wah! winning combination. We took a corner table as we thought it would help contain and confine the kids, ermmm... sorta. We had 1 set meal grilled fish and a main course of baked fish, a kids meal and soup for all to share. The waitress were kindly and nice, but a little blur. It took 10 min for plain water to be served, and then they gave only 2 sets of utensils for the adults. When we asked for side plates for the kids, that came. But it took another request for the kiddy utensils to be brought out. So busy for all the work that could have been done in 1 trip. The food was ok, but everything (including the kids meal of smiley potatos, chicken strips and fish in batter) was too peppery. Nice, bright, happy place, kid tolerant but maybe not too kid friendly. I think we will check out the other eateries in Railway Mall before going to Hooked again. Unless the kids see it before we steer them away, that is. Went to autobacs in Bt Batok, and was amazed by the set up, literally a bunglow house with attached garages, different sections/ floors selling different stuff. Paint, rims, ICE, accessories, cleaning agents, wax, tyres, carpets, horns, mirrors, steering wheels, cushion covers, brake plates, gear knobs, nick-knack holders, any and everything associated with cars. There must had been at least 20 models of horns (with maybe 10 models wired samples to test the sound and loudness). Was $2 for labor to change the bulbs and $30 to change the horn since it required dismantling of the bumper. In the end, i waved my AA membership card and was given 5% discount on the horn, and 10% on the bulbs, and $10 discount on the labor for horns. Total damage S$88.21 after GST. and hopefully not the start of itchy MOD fingers. After sticking with the same hairdresser for 3-4 years, who did short hair very very well but was clueless with long hair and who had an unnaturual fear of THICK long hair (for a professional hair dresser, so DUH. ), it was time for a change. We went down to Ngee Ann City on a Sun afternoon. Leng led me through the ground floor to a section I didnt know existed, let alone visted, and we walked into the hair salon shroulded with velvety maroon curtains. Very mysterious. After being shown into the interior of glossy high fashion glass and steel and curtain affair, where we were given silkish robes to put on to protect our clothes, and a choice of beverages being served by ah-mahs in uniform. And a pile of CURRENT local and international magazines was placed in front of me. So far so expensive looking. I was introduced to the hairdresser, and I told him what i wanted, long flowy thick hair with movement. Do-able, but main task is to salvage the chop by the previous hairdresser (who had wanted to "thin down" the volume). errr... ok. The hair cut proper. I had burried my nose in a magazine, but felt the close presence of another person beside the hair dresser, and to my surprise, his assistant (the guy who washed my hair) was holding up my hair with 2 fingers, acting as a HUMAN HAIR CLIP. Then the assistant was sorta dancing around the hairdresser, trying not to inconvenient him, to hold different sections of my hair depending on what and where was being cut. weirdness. The cut didnt take too long, perhaps 30min, it came out alright, but a little too demure for my liking. Then it was Leng's turn. The same thing happened with another assistant holding up her long hair. i had to stifle a giggle. Leng later told me that the salon didnt like the pinched marks that a real hair clip made on hair, so they have assistants to do that. My bill for the wash, massage, cut and blow was $79. A little on the expensive side, but i guess a human hair clip does come at a price. The whole thing started quite innocently with me glancing through the NUSS flyers, and found that there was actually a discount for tooth whitening package at Angel Tooth at $640.00. I believe standard prices are easily $1200. I HAD TO GO! So we went on a bright Saturday morning, full of anticipation. Alas, the Dentist had to clean my teeth and that lead to some bleeding at the gum, so we had to reschedule for the following. but but but the offer was laspsing at the end of the month wor... Oh, you'll hold the offer for me? cool. The next week, the gums were no longer bleeding, i hadn't developed sores, or had a chip/ huge hole in my teeth. All systems go. First step. Determining the hue and value of my teeth. D4. oh oh. did i like, fail some test? ok, apparently, the hues are based on types of races. As are mostly whitish for ang-mohs, Bs are greyish for Indians, Cs are yellowish for Malays, and Ds are brownish for Chinese. To see how many shades of improvement there is, the most usual way is to measure against value. Interestingly, B1 is 1 shade higher than A1. And my D4 is not the last of class, but shade #8... still. We started by fixing some kind of braces/ mouth guard which made me grin permanently while exposing all my teeth. This was just a little uncomfortable, and i had to make sure i didnt move my jaw too much and be able to swallow saliva without disloging the braces. Some gel was applied to my teeth, we waited for 10min then activated the bleaching agent (in the gel) using laser light for another 10min. 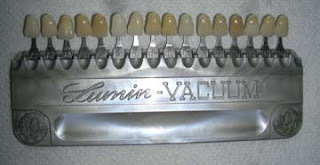 The gel was stirred on the teeth in between each set and the dentist checked on my condition. Through successive sets, the pores on the enamel will open bigger and let more of the bleaching agent into bleach the dentin (which is naturally off-white/ yellowish), but not much till the bleaching agent seeps further to the pulp or hit the nerves in the root canal. OUCH! This was done in maximum 4 sets, depending on tooth sensitivity and condition of teeth. Basically, if you have very sensitive teeth, you will be crying and howling in pain by 2nd set, and if you have dead nerves, you can go all the way to 4th. But the good news was: I had acheived shade B1! I had done some research earlier and understood that i wasnt too eat/ drink stuff that would stain my teeth, especially for the 1st 2 weeks as the pores on the enalmel were still open and will close slowly over 2 weeks. Ok, no coffee, no tea, no orange juice, not nice, but i can handle it. The analogy was, if it stained a white shirt, you can't have it. ARGHHHH! First thing first, by the end of 2 weeks, i had lost weight. LOLz. 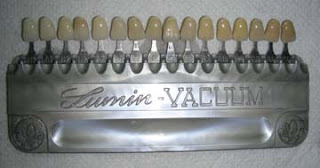 I went back for a review and found that my teeth had rebounded to 1/2 shade between B1 and A1. The dentist thought we should get it done properly, and go for another treatment to gun for B1. i.e. another 3-4 sets to touch up. i was aghast, another $640?! MORE SUFFERING, but migated with a desentizing gel that the doc prescribed that will help to decrease the sensitivity and temporary close the pores. Still A1 is pretty good lah, 6 shades improvement leh! I'm gonna be smiling alot more brightly from now on. but but but i thought only the seafood platter was chargable? the stuff that they russelled up was supposed to be free, not to mention the wine that never came? Called them the next day, no pickup. Called them the day after, somebody Indian-sounding picked up, took a message and promised that the restuarant manager will call me back... he didnt. I called back again late in the evening, and finally was transferred to the manager. I recounted the incident to him briefly and he recalled the incident immediately (it must have been a tramatic evening). Advised him that i was billed for both items, but i dont mind paying since i did consume the food that they had delivered, but i wanted to know whether they had intended to charge me for both dishes in the first place. PLUS the wine was never delivered, to which he said sheepishly "yeah, errr... they left it behind" and told me he would check when he is in the office. On the 4th day, he called to say he is still checking. On the 5th day, nothing. On the 6th day, he called to say that "yup, the billing is correct, because you did mention that you will pay for it." THEN i received a sms from Amici to have valentine's day set dinner in their restuarant.